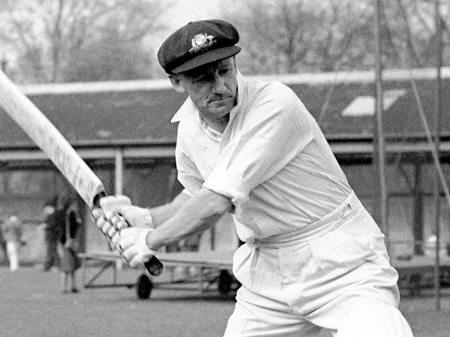 Today is the 110th birth anniversary of Australia's great batsman Sir Don Bradman. In the history of cricket, no batsmen has even came near to the Bradman's record of batting average of 99.94 in the test cricket. August 27 marked the 110th birth anniversary of world’s greatest batsman Sir Donald George Bradman or as the world knows him as ‘The Don’ of cricket was the finest batsman in the history with invincible records. Bradman’s career Test batting average of 99.94 has been cited as the greatest achievement by any sportsman in any major sport. He scored 6,996 runs in 52 matches with an average of a century in every 3 innings. 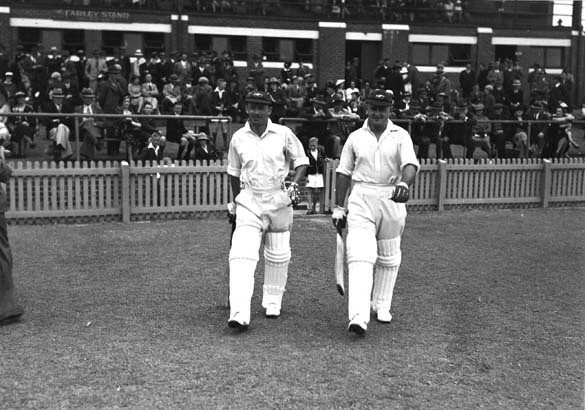 Don Bradman scored 12 test double centuries and 2 triple centuries in his career. 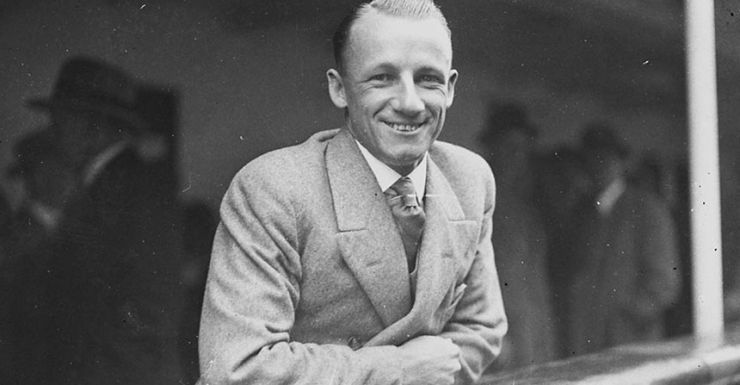 Don Bradman was famous for his great batting skills, technique and perfect shots. Cricketing legends like Sachin Tendulkar, Shane Warne, Ricky Ponting, Steve Waugh were used to follow the great cricketer Sir Don Bradman. In the history of cricket, no batsmen has even came near to the Bradman’s record of batting average of 99.94 in the test cricket. Sir Don Bradman jointly holds the record of triple hundreds in Test cricket along with Windies great Brian Lara and Chris Gayle and India’s explosive batsman Virender Sehwag. He was Australia’s 21st test skipper and was never stumped throughout his career. The god of cricket Sachin Tendulkar, in his autobiography ‘Playing it my way’ named sir Don Bradman as his idol. 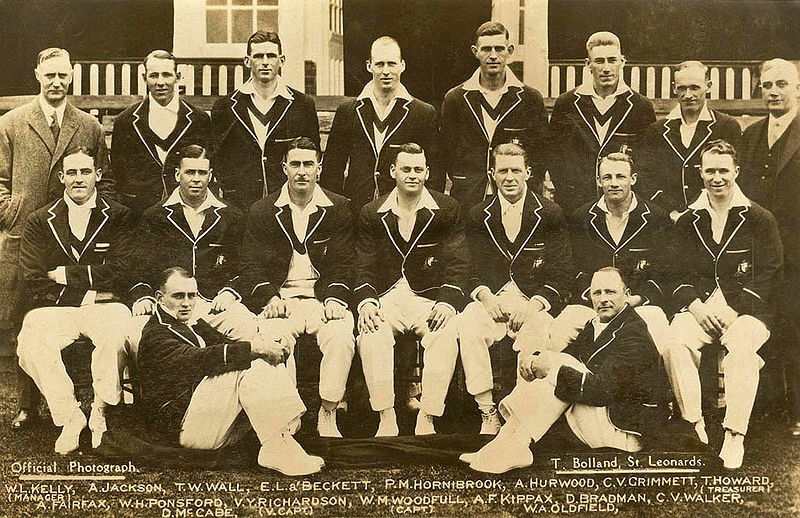 Australia’s team photograph with under the captaincy of Sir Don Bradman. 2. Sir Donald George Bradman possing for a picture of the ground. 3. 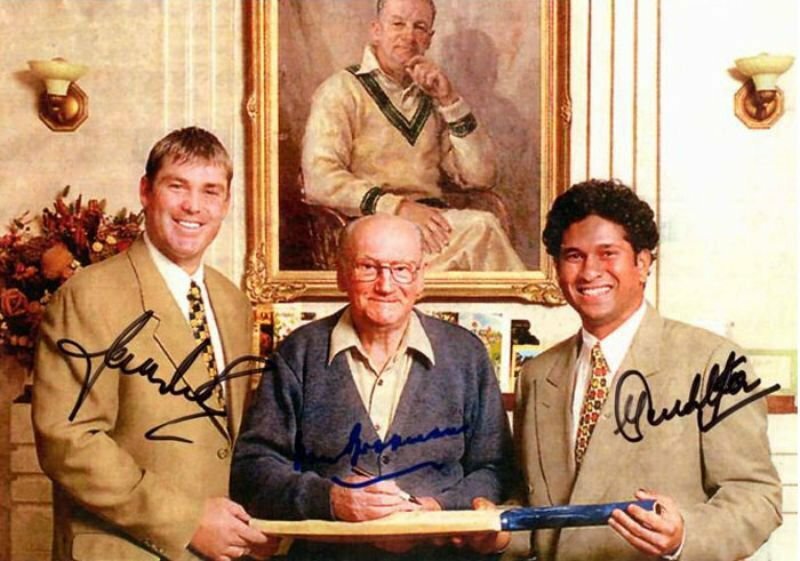 This is the picture of Sir Bradman’s 90 birth anniversary when cricket legends Sachin Tendulkar and Shane Warne met his at his residence. 4. Australia’s cricket legend making his way to bat. 5. Sir Don Bradman playing his signature cover drive and hit the ball out of boundary line.